Rosemary I found a MacBath the Silly Sea Slurpent. Thank you so much for your help. The birthday party was a big success and his picture was on the front page of the Portsmouth Daily Times in Portsmouth Ohio. Please say a prayer for my granddaughter, who will be having radiation surgery on the 30th of this month. When she was five she had a stroke that affected her whole right side and her speech. Now she has a vein in her brain that needs taking care of. I am looking for a toy that my son did the commercial for when he was about 4 years old. It is a MacBath the Silly Sea Slurpent by Hasbro, a Purple Plastic Serpent that squeaks and squirts water. The commercial was shown between 1980 and 1983. I found the commercial and bought the DVD recently, and that’s where the photos came from. 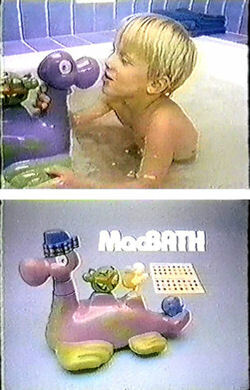 The MacBath commercial was shown a lot, according to verbal reports from our family. I found a Snoopy toothbrush unused in the box, a Skedoodle in the box, and a Snoopy Splash n Play Sprinkler. Please help. I want to give this to him for his birthday next month if possible. His father passed away last year, and their birthdays are only one week apart. I would like for his birthday to be special this year.